Yesterday the power of Persistence was revealed in a quick blog. The power of persistence can be complemented with the power of Change. Change is automatic yet it could be rewarding or frustrating. One could flip on either side of the coin if he doesn’t know how to ride a change. 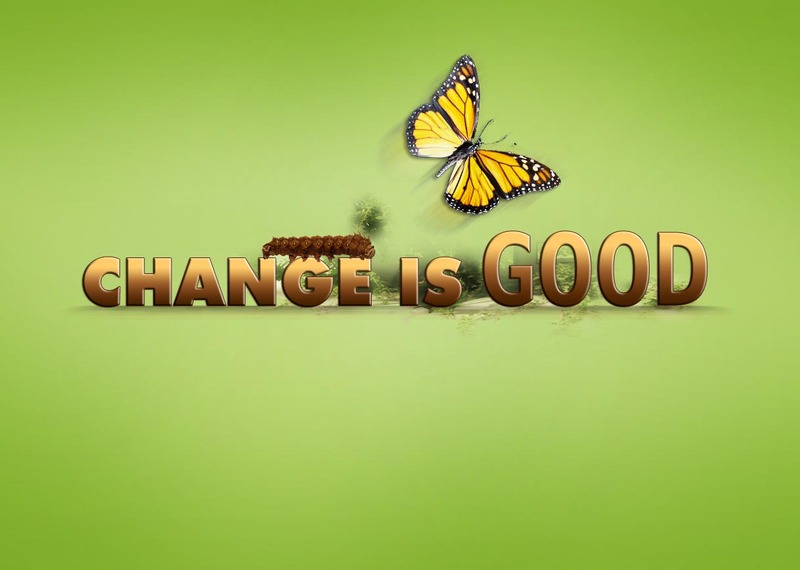 Change is anything that transforms a current state of person, place or thing in to a new state. Change could come as a surprise to those who aren’t prepared for it or who close their eyes and say everything around is calm and serene when the storm is raging and those who get ready for it & face it. People lose jobs, they get new jobs, people lose their belongings and they create new ones. People lose their loved ones and they get a new person in their life. The earth’s atmosphere changes a million times in a day. Every 4 years a person has a new body, it looks the same more or less yet all the cells in the body have been replaced by then. Why does change drive people to Nuts? Is it the complacency people acquire to stay comfortable in the place they are? Is it the fear of losing what they already have acquired over years? Reasons could be many, yet the basic underlying reason is the fear instilled in mind that change will bring along mis fortune along. The fear of being uncomfortable, the fear of uncertainty, the fear of being worst off than before. Sometimes it is relating to the person we know of who went through misery. How to deal with Change? First, there is a lot of cleaning work required to cleanse the predominant thoughts about change in mind. It is a change in perception about CHANGE. Perceptions are formed over a period of time and they become reality of mind afterwards. To get to the root of the problem we have to clear our understanding of change. Change doesn’t happen with the intention of doing good or bad. It is just a transformation agent that is doing it role. What’s opposite of change is Death. Death is a reality and that is the final change a person undergoes to transition him from this planet. Hence, change in itself doesn’t have any agenda of its own. We attach meaning to it by measuring it within our parameters of good or bad. Second, understand that change is necessary. If we were to stay in our mother’s womb forever cos that is the safest place with a lot of nutrition and protective layers, would we survive? This change was required to take birth. So, if the fundamental source of change is bringing one to life how could it be Bad? Change could bring discomfort for some time but that is to realign our mind or body. For e.g. If tomorrow morning when you are taking your regular route and the road is now closed and you have to follow a new path, it would mean discomfort but that was done so that the traffic could be balanced out. You discovered a new route that is even more pleasant or has something unique you never saw. May be you find a repair shop for your car you were searching for long on that road. It is how we see the change. When people lose job or are about to lose job they get extremely tensed and for that part it is natural. However, what is the point in working being redundant at a place where your value is only to fill in an empty space. You might as well explore something that is personally rewarding, something you always wanted to do and in the long run it will create total abundance for you and your family. I talk to a many people who go through this stage and they express deeper resentment while leaving job especially when they are asked to leave. When we walk over the opportunities putting it on the board that are waiting for them, they feel better. I spoke to one such person who lost his job and after 3 months when I again talked to him, he was happy he got a job in another city. See, there was a bit of discomfort of moving from his city to a new city (Bangalore), yet he had a job he wanted and the kind of salary etc. What appeared to be a Bane was in fact a boon. The little discomfort is always there but it takes you closer to another comfort. Third, when such change is happening it is very important to make a chart of what is good that will come as a result of this change and what is it the momentary discomfort that it will bring along. Write it in details. For each discomfort areas write down one action plan or a provision you will make to take care of this discomfort. In this case the discomfort of having to manage with whatever money one has until he gets a new job, the action plan could be cutting down unnecessary expenses, using the savings more smartly, meeting more people to explore new job opportunities. When you have a provision for the temporary discomfort its gravity drops down. Fourth, step is being proactive. That means anticipating what changes could come along the path and being ready with the mitigation chart. Taking action is imperative. Take small action steps every day to get stronger at the mitigation. When you know you have OPTIONS you are relaxed. Write them down. Fifth, measure progress. Change is automatic but progress isn’t. One has to be making progress to reach a goal. Hence, to make a progress take every day steps to move closer towards your goal. Measure the progress impartially. Consider asking someone for a feedback. Incorporate action steps to correct you. Feedback will re direct you to your right path. Do not shut down your brain while working on feedback. If you doubt the feedback is biased ask more people. Sixth, once you successfully ride a change, you are set to manage any change in life. Maintain victory log that will remind you of how you rode the change to be successful. Share it with people. When you share your success story people get motivated to get out of their comfort zone and second, they start liking you for who you are. The art of Kaizen states that “Change for Better”.